This is a beautiful MARANTZ 1060 Integrated Stereo Amplifier that has been stored in a taped box , inside a storage cabinet for years. There are no scratches anywhere, Everything Works and Sounds Great!! This unit weighs 18 pounds of awesome power. There are to many features to mention. 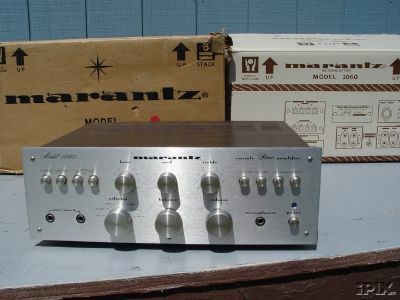 If you are not familiar with Marantz's reputation please investigate, you will hear nothing but high praise. For enlarged pictures, click images. 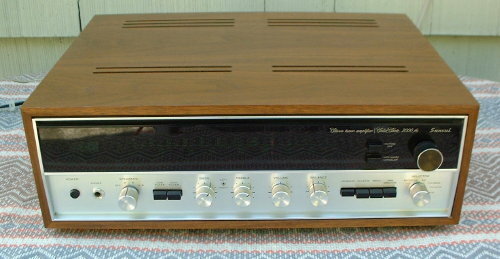 Sansui model 2000 Stereo Receiver in EXCELLENT CONDITION. Sansui receivers from the 1970s are still in great demand today, and for good reason. They just don't build 'em like they used to. The Sansui 2000 is conservatively rated at 36 watts per channel RMS (4 ohms) and 32 watts per channel RMS (8 ohms). It has all the features you'd ever want for a full fledged stereo setup, and it looks so much better than the black plastic units of today. It comes with a beautiful optional wood cabinet. Cabinet has a few tiny scratches, but still looks great. The faceplate is also outstanding, although there is one minor scratch. All lights are working, and controls have been cleaned to eliminate any scratchiness. Sound quality is very smooth, effortless and powerful. Also comes with its original Operating Manual and also its Service Manual. If you want to estimate the shipping cost for this receiver, use the on-line UPS Cost Calculator. The shipping weight will be 38 lbs., and it will be shipped from Zip 75460. Local pickup would be preferred.